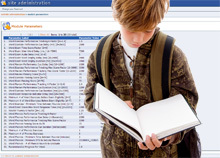 Dynaread Treament Program — Your child cannot read, or has reading difficulties? Our program can make the difference! Dynaread is specifically designed to help older children (age 7+) in need of reading help. Our approach offers valueable benefits for older children who cannot read or who are in clear need of reading help. Using the latest findings in the fields of reading science and cognitive neuroscience Dynaread teaches your child to read through reading. Dynaread is solidly language-based. Each lesson prepares your child to read real, intelligent, non-fictional texts sufficiently fluently and accurately to allow comprehension. With Dynaread, children learn to read through reading. T he online lessons are broken up into eight manageable segments lasting three to four minutes each. We recommend one to two (ideally two) sessions a day. Each session lasts 20 minutes. After the first two weeks, children know their way around the modules and can work fairly independently. Older children appreciate this independence: It further enhances their feeling that they can read and that they can do it. Dynaread incorporates Artificial Intelligence: It's a dynamic program that automatically adapts to your child's performance and progress. This assures that your child will ride the wave of maximum attainable progress with the highest possible experience of success. When our dyslexia tests reveal potential additional complications, we have the means to implement further customizations to the reading help and remediation provided in order to better serve the child. Using the latest findings in the fields of reading science and cognitive neuroscience we get your child reading. The brain uses two routes in reading: a Fast Route or lexical route for fluent reading and a Slow Route for sounding out new words. Four out of five Dyslexia subtypes show reduced functioning of the Slow Route system. Yet, most of these children do possess a fully functional Fast Route reading system. Dynaread cashes in on this and fills your child's Fast Route system in 195 lessons with 3,600 words (approx. 18 months). New words are consistently introduced accurately (accurate spelling/orthography and pronunciation) and exercised in contextually, semantically and syntactically correct fashion. Dynaread also includes a direct phonics instruction module (see further below). "In the last lesson we learned a great deal about rivers and how rivers benefit plants and animals as well as people. We talked about how in early history when people settled in a new area they wanted to build their town near a river. Living near a river helped to make farming easy and gave people water to drink. The river was also used as a means of transportation." Dynaread lessons build a sequentially expanding reading vocabulary. Each new lesson introduces a maximum of 24 new words. Authoring engaging and honoring lesson texts form our starting point. Our patented model then extracts these new words and - using an array of techniques from Cognitive Neuroscience - allow your child to effectively drill these into their Fast Route reading system. Approximately 95% of our students require three short sessions (typically spread over two days) to master these words. When evidenced, they are presented the reader text. This is when the light goes on. They find themselves reading meaningful text sufficiently fluently and accurately. Not only that: They actually get something out of it, as their fluency and accuracy delivers proper comprehension. The actual reading of sound intelligent texts ascertains contextual, semantical and syntactical anchoring of all new words. As your child's attitude towards reading changes for the better, we introduce direct remediation of the Slow Route reading system. The Phonics-module trains your child on all common grapheme-phoneme conversions in the English language. The Print-module allows your child to print-out completed readers. Children experience this accumulation of print-outs as rewarding. They gradually build up a binder full of readers that they can fluently read and comprehend. This binder offers the added value of allowing vacation breaks in the program, without loss of skills. As long as the child keeps on re-reading these readers, all words mastered remain readily available in their Fast Route reading system. Following vacation, the child can simply proceed directly with the next lesson. Don't let your child continue to struggle. Together, we can make a difference! Instead of "I can't read" I now hear "Can we go to the library?" Mr. Dekkers was a pleasure to deal with. It is obvious that he sincerely cares about helping children. I highly recommend both Dynaread and the support team behind the program. Dynaread respected my child. With the help of Dynaread he is now standing tall, he is confident, and he can read just like his friends.